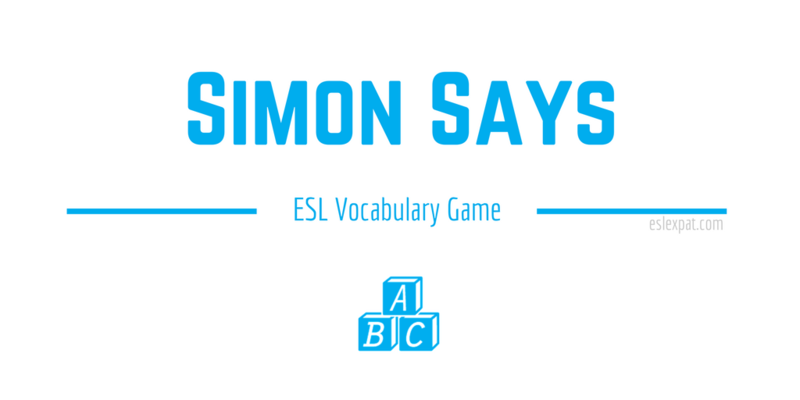 The Simon Says ESL Game has always been the “go to” activity for teaching kids body parts and other vocabulary. You can also play it with objects in the classroom or even saying common expressions or phrases that you would like to review. Not much is required to prepare for the game ahead of class. You may want to have some flashcards or pictures prepared for some of the vocabulary, but it isn’t absolutely necessary. The aim of “Simon Says” is relatively easy for most kids to grasp. Once they catch on how to play, it basically runs on autopilot. Though, for very low levels, the most difficult part of the activity is explaining the rules. Since it is usually played with elementary students, their understanding of explanations in English requires some patience. If you can’t find someone to explain the rules in the kids’ native language, the best way is to model the activity and do a few examples first. First, have them all stand up and tell them to listen and watch what you do. After your demonstration, they should be able to understand that they should do ANY action that you say as long as you say, “Simon says.” If someone performs an action when you DON’T say, “Simon says,” then they should sit down. Next to each sentence, draw a stick-person performing the action followed by a check-mark. Next to these sentences, draw a stick-person with his hands down followed by an “X” to signify that no action is performed. By explaining the rules in this fashion, most students should grasp the concept of the game regardless of their level in English. Remember that you can use other expressions and actions that use different expressions. Anyway, you can see how it could be used to reinforce a variety of vocabulary while having fun at the same time. Finally, after a few rounds, you could have the students take turns and take the role of the teacher. Have them come up and conduct their own version of the Simon Says game. Once they have each had a turn, finish up the activity by reviewing any difficult vocabulary or even check out the Postcards ESL Writing Activity for a change of pace. If you like to practice idioms in class, the Movie Idioms ESL Speaking Activity is great for more intermediate to advanced students.